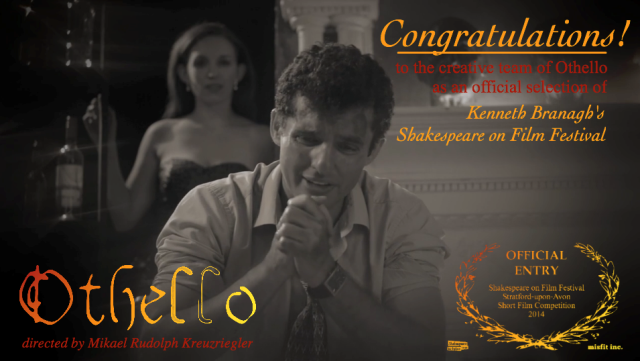 Congratulations to City Shakespeare Company co-founder Allison Volk whose short film adaptation of Othello, which she produced with Loyola Marymount University professor and director, Mikael Kruzriegler has been accepted into the Kenneth Branagh’s Shakespeare Film Festival in Stratford-upon-Avon. Othello will premiere in England on November 6, 2014. The festival is sponsored by the Shakespeare Birthplace Trust, dedicated to preserving Shakespeare’s home town. Volk is currently in Niwot, Colorado filming her first feature length film, an adaptation of Shakespeare’s Macbeth which features a script co-written by her City Shakes co-artistic director Brooke Bishop that takes place on one night in the Macbeth household; the night the king is murdered.